Do millennials like your Snapchat or Instagram ads better? More people reported “loving” Snapchat ads than Instagram ads. Similarly, the percentage of people who “hate” Instagram ads was slightly higher than those who “hate” Snapchat ads. However, it should be noted that the highest percentage of respondents rarely noticed seeing ads on either platform at all. This is possibly because ads on these platforms often imitate the User Generated Content that people see their peers sharing organically. 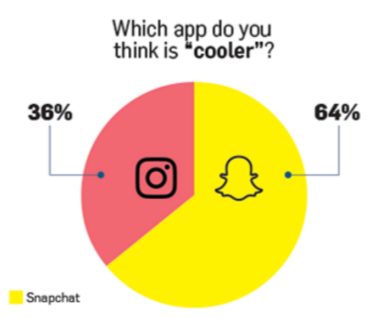 Snapchat was viewed as a significantly “cooler” app than Instagram. 64% of respondents said Snapchat was the cooler app while 36% claimed Insta was cooler. Maybe this is because Instagram has been around for twice as long as Snapchat, which makes Snapchat newer and hipper. More people remember specific Instagram ads than remember specific Snapchat ads. 74% of people don’t remember specific Snapchat ads they’ve seen while 62.6% don’t remember specific Instagram ads they’ve seen. The disparity is likely due to the “gone in a flash” nature of Snapchat ads. More respondents predict Instagram will still be around in 5 years than predict Snapchat will last that long. While 36.6% predict Instagram will still be around in 5 years, 26.8% predict the same for Snapchat. This puts Instagram in more of a timeless category, even though Snapchat is possibly “cooler.” So which app is the ultimate millennial champion? Based on these results, it’s hard to say. While Snapchat ads are gaining traction, and are loved by more millennials than Instagram ads, they’re also gone in a flash and are less memorable. Similarly, while Snapchat is the hottest up-and-coming app, many users say it won’t be as relevant in 5 years. Still, millennials think Snapchat has better features than Instagram does in this day and age, so it’s important that both apps stay on the cutting edge to continue increasing user loyalty. Read the full ADWEEK report here.